The big dog coyote was chewing on a deer carcass at the side of the road when we came ’round the bend. My guide slid the truck to a stop on the snow-dusted gravel, and I bailed out. I could have taken a running shot as the coyote bolted up the brushy snowberry slope through ankle-deep snow, but I learned a long time ago that a longer standing shot from a steady rest is easier for me than a short-range running shot. I stepped up to the fenceline, instead, and when the coyote stopped and turned broadside for a look back at 200 yards, I centered its chest in the crosshairs of the scope and put the final pressure on the trigger of the Model 700 Remington. The hefty Alberta coyote went down without a twitch, and when we skinned it, we found that the little 20-grain AccuTip .17 Fireball bullet had disintegrated in the chest cavity, causing massive internal damage without any exit hole. Not quite. A couple weeks after that hunt, I was cruising the back roads of southwestern Colorado hoping to see a coyote when I instead saw a huge tom bobcat working along a rocky ridge 250 yards from the road, on the far side of a steep canyon. The wind was gusting at 15-20 miles an hour as I sneaked to the top of a knoll, already mentally adding that $300 pelt to my fur collection. But the wind swirling up out of the canyon raised havoc with the little 20-grain bullets, and with a brushy background, I had no idea where I was missing. The cat sat through the entire fusillade, then rose and walked unscathed into the cedars. No doubt the .17 Fireball is a joy to shoot, superbly accurate from the right rifle with virtually no recoil. However, that light pill traveling at 4,000 ft/s is inherently susceptible to wind drift, and I offered my .17 Fireball for sale or trade. My first real predator/varmint rifle was a bolt-action Remington .222, and after spending my early high school years hunting with Dad’s pump-action .30 deer rifle and a surplus .30 Army carbine, I thought it the epitome of accuracy and efficiency. I was new to reloading and believed that speed was the key to performance, so I loaded then-new 40-grain Sierra Blitz-King bullets to just below maximum. The load shot great in the .222 and also my next varminter, a .22-243 (now known as the .22 Cheetah). The blazing bullet devastated everything from picket pins to prairie dogs to jackrabbits and red fox, and I thought I was set for life. That changed during my first winter at college in Brookings, South Dakota, when I learned that the local mink farmers were paying $1 apiece for white-tailed jackrabbit carcasses. I already was getting a buck for the pelts, and adding the meat market money made for a fairly lucrative deal way back when. However, neither the mink ranchers nor the fur buyers wanted the badly damaged goods left behind by my hot varminters. The same held true for fox pelts, which were fetching the astronomical price of $2 each but only 50 cents or so for badly damaged skins. I switched to 50-grain full-metal-jacket Norma bullets, figuring they would make clean kills without overly damaging the goods. They worked great for the jacks and red fox, but results with heavily furred South Dakota prairie coyotes, especially at longer distances, were less than satisfactory. A number of coyotes took second and third hits, and some walked away. About that time, I traded the shot-out .22-243 for a pre-64 Winchester Model 70 in .220 Swift. I marveled at the superb accuracy, fast handling and flat shooting. However, the factory load with a 48-grain bullet traveling at the touted 4,000 ft/s was not only devastating to anything hit, but, according to the gun writers of the day, hard on the chrome moly barrels. A reputation for short barrel life doomed the great cartridge to an early demise. After experimenting, I settled on 52- and 53-grain Sierra benchrest bullets loaded to just below maximum velocity. The hollow-point, boattail bullets delivered pinpoint accuracy with a ballistic coefficient that provided a flat long-range trajectory; they also did a good job bucking the wind. The benchrest design, with a thicker gilding metal jacket around the hollow point, caused the bullet to peel back like a banana rather than compress and explode on impact, as do lead and poly-tipped bullets. This provides reliable knock-down power without total destruction, making a very fur-friendly bullet. 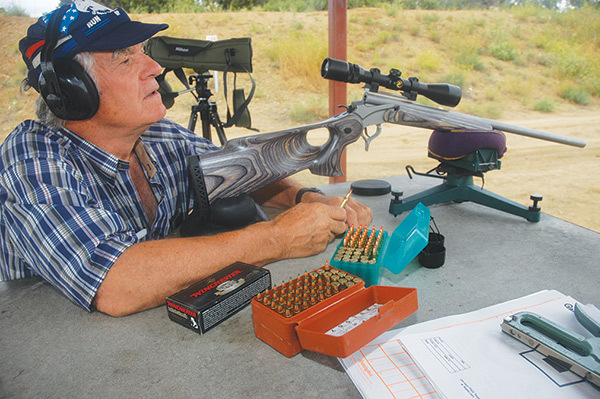 I couldn’t believe it a few years back when Winchester hit the market with super-accurate Supreme ammo in .220 Swift—again loaded with a 48-grain bullet at 4,100 ft/s, basically the same load that has dogged the cartridge since its introduction in 1935. Undeterred by a lifetime of bad press, they followed with .22-250 ammo with the same bullet at around 4,000 ft/s. Both are accurate and utterly devastating on small varmints, but their sensitivity to wind negates the flat-shooting advantage. A 52- or 55-grain hollow-point boattail or polymer-tipped bullet at slightly less velocity makes a much better all-round predator and varmint load. Varminters are mostly interested in high-velocity destruction, and a new crop of lightweight varmint pills accomplishes this with ease. The 36-grain Barnes Varmint Grenade, the Sierra 40-grain BlitzKing and the Berger and Hornady 40-grain varminters are but a few of the lightweight varmint bullets available today. Any poly-tipped spitzer in 35- to 40-grain weight should do the deed, and all are accurate in my .222 Remington, .223, .22-250 and 220 Swift rifles, with either 1:14 or 1-:2 rifling twist. Bullets with polymer or lead tips or thin forward jackets literally explode on entry, and ballistic gel testing confirms this. The higher the velocity, the more drastic the expansion, followed by bullet disintegration within a few inches. The exception is a solid-copper Barnes 40-grain TSX hollow point. The TSX opens quickly to create a wound channel yet maintains its weight and continues for another 12 inches through dense gel before stopping. I’ve shot several coyotes and fox with this bullet, getting instant kills at short to long range with a small exit hole. Dynamic Research Technologies should be hitting the market this year with a 39-grain frangible bullet that takes a different approach. The DRT features a compressed copper or tungsten core under a thin gilding metal jacket, designed primarily for law enforcement and Navy Seals who need to inflict instant terminal damage on bad guys. The original DRT weighed 79 grains with a tungsten core and was well suited to the faster twists of AR-style rifles. This was followed by a 55-grain pill of the same length with a lighter (and cheaper) compressed copper core. Dustin Worrell, chief DRT designer, fashioned the new 39-grainer in an attempt to produce a predator/varmint bullet that would work as well in .22-250 and .220 Swift rifles with 1:12 or 1:14 twist barrels, as well as in .222 and .223 barrels with slower rifling twist. The superbly accurate bullets are designed to penetrate hide and bone but then explode inside the body, where the compressed core disintegrates into shrapnel-like particles that produce tremendous hydrostatic shock and tissue destruction. I’ve shot coyote and fox with the 55-grain DRT bullet, knocking them flat with only a small entrance hole and no exit hole. 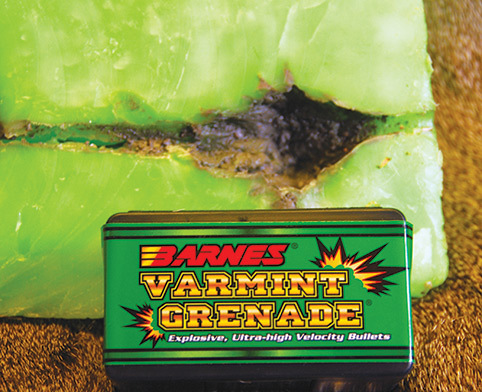 Early results with the 39-grainer indicate it may become a favorite lightweight varmint/predator bullet. Accuracy has been impressive, and the frangible bullet delivers predator-stopping punch even at longer ranges when shot from one of the hotter .22 varminters. Generally, lightweight bullets work best in calibers such as the .222 or .223 where velocities are a bit lower, especially when it comes to saving pelts. Even at these somewhat slower loadings, the lightweights blow picket pins, gophers and groundhogs to kingdom come. In hotter .223 WSM, .22-250 and .220 Swift loads, you may see small entrance holes and no exit holes with big coyotes, but with lightweight coyotes, fox and cats, I’ve had to do some serious stitching, especially following close-range hits on called-up critters. Yet the bigger failing of some lightweight predator/varmint punchers is their tendency to drift in the lightest breeze due to a low ballistic coefficient, and perhaps a lack of sufficient punch for bigger coyotes at longer range. This limits effectiveness in open country where there always seems to be a breeze blowing and longer shots are the norm. In fact, limited long-range capability may be a consideration wherever predators are spooky and wary from hunting pressure, much more of a problem today than in the past. When it comes to the nitty gritty of harvesting fur at all ranges and under all conditions, I’m sticking with time-proven 52- and 55-grain hollow-point and polymer-tipped boattail bullets in most .22 varmint rifles. But lighter weight predator projectiles certainly have gotten better, and I’ll keep testing them. Last fall, I shot two called-up coyotes in Iowa. One was standing broadside at 20 yards when a 40-grain Barnes bullet from my .22-250 dropped it in his tracks. The other called-up dog was hit head-on at 30 yards with a 39-grain DRT from the same gun. Both bullets were loaded to just under 4,000 ft/s, using Hodgdon’s new 8208 XBR powder. Both were instant kills with no pelt damage. Later in the winter, I shot another big dog with the .22-250 at over 300 yards; the DRT flattened it in its tracks, again with no pelt damage.